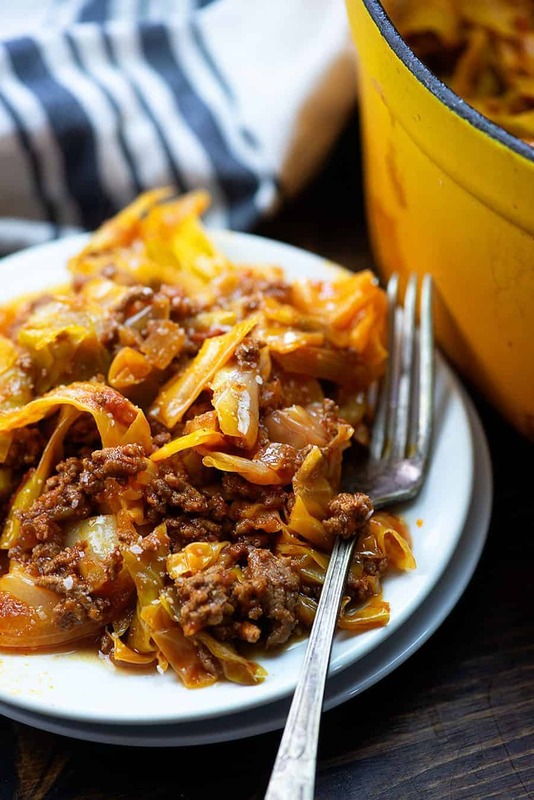 Unstuffed cabbage rolls have all the flavor of a traditional cabbage roll with minimal work! 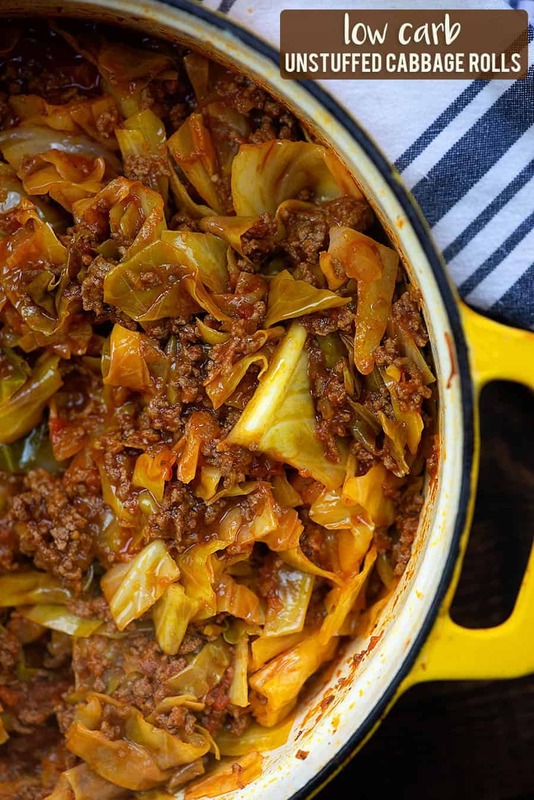 This low carb cabbage rolls recipe is super filling and totally easy for busy nights! My family and I went on a cruise around the British Isles last year and it was a seriously amazing trip. We stopped at 11 different ports and I absolutely loved trying the different foods in each port. But what I loved even more was watching my son get excited seeking out local restaurants to get an authentic taste of each country. One of our ports had a little Russian restaurant that he insisted on trying. We were in Scotland at the time, but he’d had enough shepherd’s pie and wasn’t interested in trying haggis, so we got a little taste of Russia. He ordered cabbage rolls and I was super skeptical over whether or not he’d like them. Y’all, the kid LOVES cabbage. I’ve been making all kinds of low carb cabbage recipes for him since then. 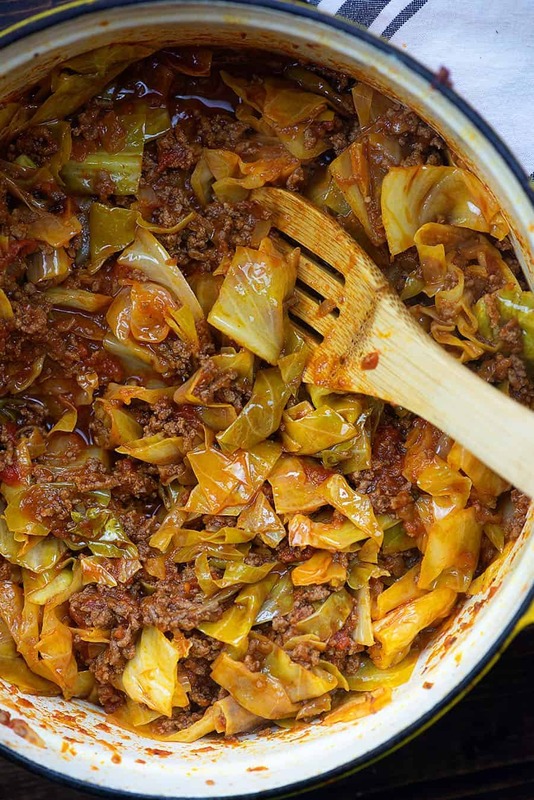 This unstuffed cabbage casserole might just be his new favorite. 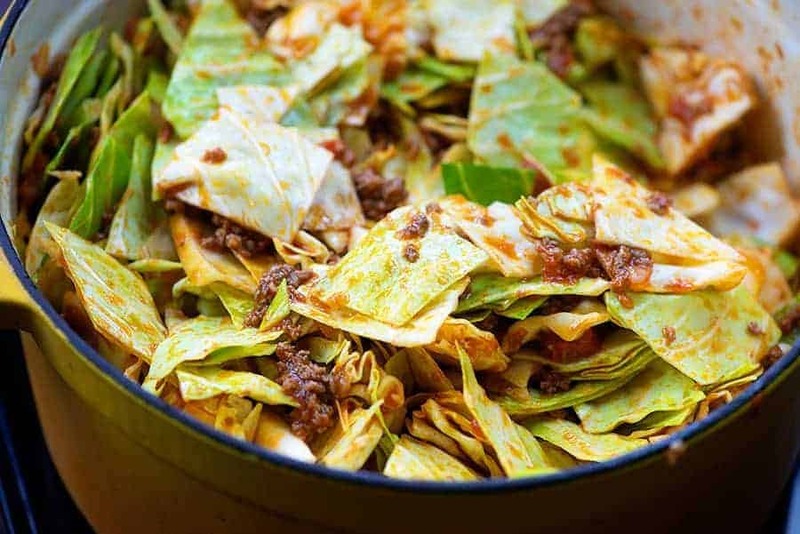 Rather than take time wrapping cabbage leaves around a filling, we’re just going to dump chopped cabbage right in with the filling mixture and let it all cook together. So easy and you still get all of the flavor! To start, you’ll brown up some ground beef. 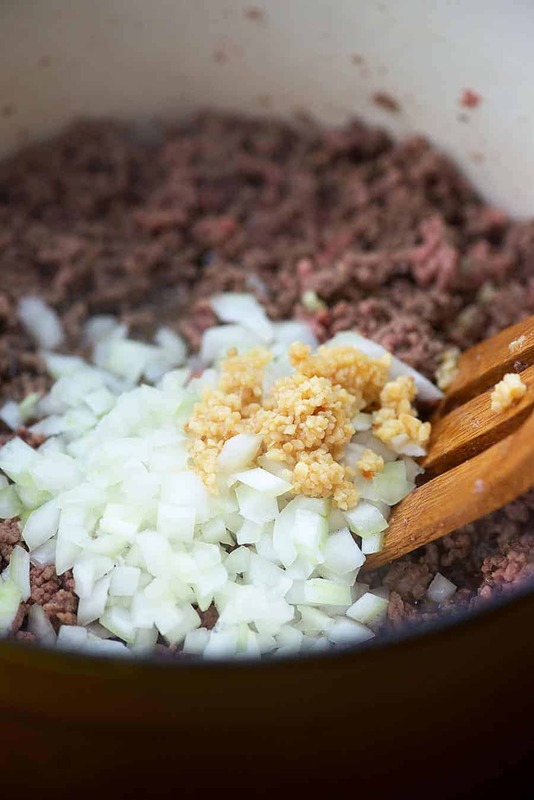 When the beef is partially browned and fully crumbled, toss in some diced onion and minced garlic. Once your veggies have softened up a bit, stir in some marinara sauce and a bit of water. I use Rao’s marinara because it’s the BEST tasting sauce I’ve found in a jar and it also happens to be the lowest in carbs. Isn’t that a win? Next, you’ll chop up a head of cabbage and add that to your pot. Just stuff it all in there and stir carefully. The cabbage will cook down some and your pot won’t be quite so full. Let the cabbage cook down until it’s nice and tender. 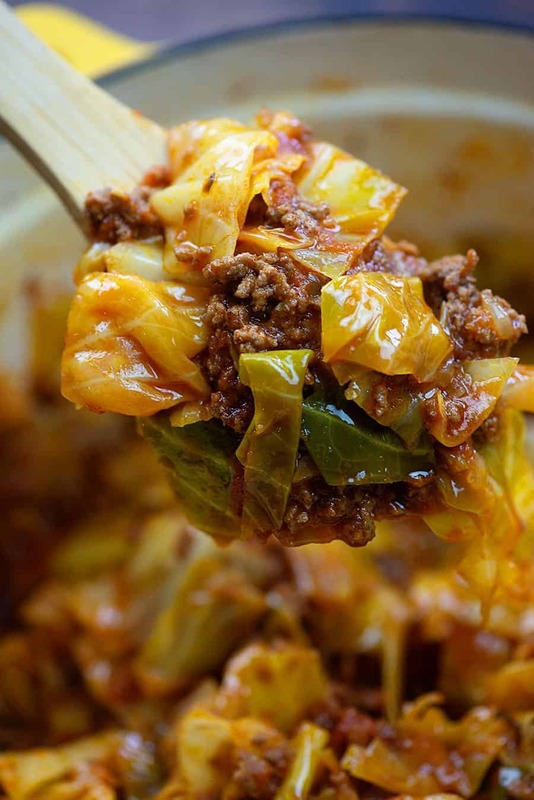 These unstuffed cabbage rolls are ready to eat in just about 30 minutes. Sausage Egg Roll in a Bowl: The most popular recipe on my other blog! Avocado Egg Salad: This one is for the avocado lovers out there! Cauliflower Potato Salad: You won’t miss the potatoes, promise! Brussel Sprouts and Bacon: Who would have guessed Brussels sprouts cold be so tasty? 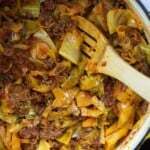 Take the work out of cabbage rolls with this low carb cabbage roll casserole recipe! Continue cooking, stirring occasionally, for 20 minutes or until the cabbage is as tender as you'd like. This looks delicious. Thanks for sharing. I will be fixing this for dinner for my family today. Second time making it tonight. Add a bit of cream at the end to cut the acidity. Serve it owner rice for the rest of the fam. Delicious!